SAVANNAH, Ga. (CNS) — Over the course of nine days in May, more than 9,000 patients received free medical, dental, ophthalmological and/or veterinary care as part of Operation Empower Health — Greater Savannah. The initiative is a joint effort between the St. Joseph’s/Candler health system, Georgia Southern University and the U.S. Department of Defense. Its true impact on the surrounding community can’t solely be assessed by the number of patients and animals examined or even by the 26,000-plus procedures performed on them. Rather, even more telling are the physical and emotional impacts the program had — and will continue to have — not only on its patients but also on those who served them. “The hardest part for us is we have to turn people away,” said Lt. Col. Andrew Magnet, mission officer in charge. He noted the finite number of physicians, dentists, optometrists, veterinarians and pieces of equipment available as well as the rapidity with which available time slots filled up. 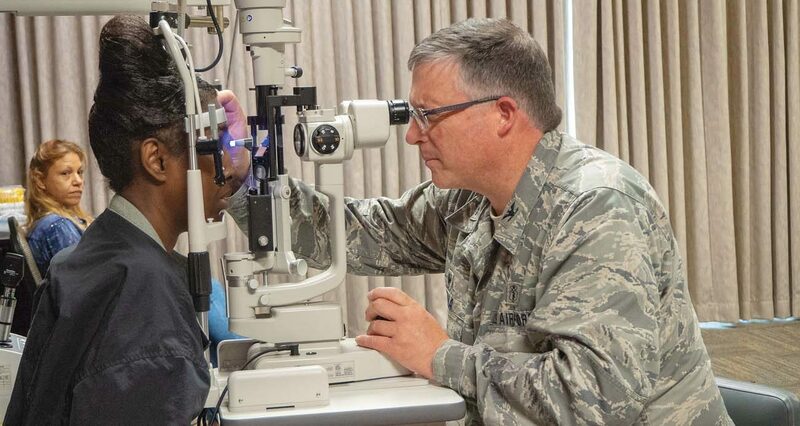 A physician with the 165th Airlift Wing based in Savannah, Magnet added that while he and his peers had expected to receive patients from as far away as Jacksonville, Atlanta or South Carolina, they were surprised when even patients from Orlando showed up. Mercy Sister Pat Baber, director of the St. Joseph’s/Candler St. Mary’s Community Center and Health Center, said that had it not been for the program, some illnesses and conditions wouldn’t have been detected. “You get two services automatically, and it’s a good thing because we’ve caught a lot of high blood pressure and a lot of diabetes. They didn’t know,” Sister Baber told Southern Cross, the newspaper of the Diocese of Savannah. “We have a man who we think is probably soon to have a heart attack. As Maj. John O’Brien, a nurse with the Delaware National Guard, suggested, so many of the patients who came for treatment belong to what he described as “the hidden population of folks” — those in local communities who are often left behind or overlooked in their communities, perhaps because of a lack of insurance or inability to pay for necessary care. “I’ve been waiting a long time, some years just to get to this point,” said Savannah resident Connie Green. She first learned about Operation Empower Health through the Garden City-based Good Samaritan clinic, operated in partnership with the Georgia Department of Community Health and Our Lady of Lourdes Church in Port Wentworth. Other unique situations shared with the approximately 400 “boots on the ground” involved in the operation like Lt. Col Janice Weixelman, a family medicine physician with the Wyoming Air National Guard, included health issues impacted by the death of family members and difficulties renewing necessary prescriptions like the water pills that patient Herbert H. Woodley Jr. said he needed for his high blood pressure. Aside from various kinds of health care professionals, also on hand for Operation Empower Health was a physician of the soul: Father Matthew Ericksen, who serves as a chaplain at St. Joseph’s/Candler Hospital and also is parochial vicar at Sacred Heart Church in Savannah. “I’ve been told that by a priest being present it helps to improve the level of comfort and trust among those who are coming as patients,” Father Ericksen said. Magnet later said that having a priest available may also have helped assuage the anxieties of those without documentation who needed care. According to Magnet, Operation Empower Health also was designed as an exercise in refining both civil-military relationships and intramilitary relationships — military members learn each other’s jargons, insignias and capabilities — and training for the possibility in which an extensive military-wide medical response might be needed. Because of the role the Air Force played in her treatment — extracting her wisdom teeth — Maeli Cruz, a 17-year-old student at John Paul II Catholic School in Okatie, South Carolina, remarked that she’d consider joining up as a means of helping people just as they helped her. She pointed to the importance, for example, of proper foot care, diet and blood sugar management. Sister Baber also urged local medical facilities to follow their lead and assist with follow up and specialty care, based on the overwhelming number of patients — especially dental — they diagnosed and treated. Marsala is assistant to the editor of Southern Cross, newspaper of the Diocese of Savannah.